The original Pebble smartwatch was one of the first wearables on the market, beating Apple and AndroidWear, and winning the hearts (and wallets) of Kickstarter backers globally. When Pebble returned to Kickstarter to release a second device, the Pebble Time, it was a controversial decision, but despite that it managed to reach $1m in 49 minutes, and currently holds the record for the most funded Kickstarter of all time. The Pebble Time is almost the antithesis of the Apple Watch, it's affordable, cross-platform, and more... 'geeky' (for want of a better word). The most popular smartwatches feature slick, polished designs, whether it's the aluminum and steel of the Apple Watch, futuristic aesthetic of the Moto 360, or classic good-looks of the LG Watch Urbane. While those could be considered the Rolexes and Tags of the smartwatch world, the Pebble is definitely the Casio. That's not a bad thing -- more Casios have been sold than Rolexes after all. The Pebble Time is suitablyunderstated, especially if you get the black model, and unless they're a true tech fan, most people wouldn't even know you're wearing a smartwatch. At 1.25-inches the screen is on the small side, but still manages to convey the necessary information (who's calling, short messages, etc.) but longer text gets cut short (for instance, you can only read the sender, subject and first line of emails). The Pebble Time has retained a battery-friendly e-ink display but gets a 64-colour bump, and a pixel density of 180 PPI. Being e-ink rather than LCD gives it a retro look, similar to an old Game Boy Colour screen. It's not as bright, sharp and impressive as the Apple Watch's OLED, but it's bright enough to see in broad daylight, especially with the backlight on full whack. The major benefit to the e-ink display is that it remains on 24/7, this is much more useful than the on/off LCD screens of other watches. The Pebble Time is impressively thin at 9.5mm (much nicer than chunkier rivals). This also makes it very comfortable to wear, and means it doesn't get caught on shirt sleeves. The back of the watch is slightly curved so it sits on the wrist nicely and it's featherweight at 43 grams. The standard watch strap is comfortable, although a bit chunky. That's not a problem, however, as the Pebble Time can accept any 22mm watch strap. The front of the watch is dominated by a large bezel -- we didn't find it massively distracting -- but some people might. The display isn't a touchscreen, instead the Time's UI is controlled by four buttons, one located on the left side of the watch, and three on the right side. The buttons are large, easy to locate and require a firm press to operate. You'd think accidental button presses would be a problem, but we haven't experienced this once. Finally, the Pebble Time is water resistant to 30 meters -- we didn't test it to that depth, but we did take it white water rafting, where it survived. Battery Life has been our main concern with the current crop of smartwatches -- one or two days simply isn't good enough. Pebble claims the Time lasts 'up to' seven days, but we found that five was the max -- this is still much longer than rivals. We also really love the feature where Pebble still acts as a regular watch, simply telling the time, for around 24 hours after the battery is dead -- this should mean you're never left without a working watch (unless you're stranded on a desert island for more than seven days, at which point having a watch would be that last of your worries). Charging is also a pleasant experience, with a magnetic charger that's easy to locate, and a quick one-hour to 100-percent. The interface of the Pebble is smart and simple. Navigating the UI is like a timeline, with the watch face is the present, moving up looks at past events (calendars, missed calls, sunrise) and moving down shows future events (upcoming appointments and sunset). Selecting the watch face will open up the apps and settings menu. Just like scrolling through the timeline, browsing the apps is simple and intuitive. You make selections with the central button on the right, and go back by pressing the button on the left. Navigating the Pebble's UI is fast and snappy, despite the device's low-powered internals. It's filled with cute little animations which don't slow the experience down. Because of Pebble's popularity an impressive number of big-name app developers have adopted it -- for example, Misfit, ESPN, PayPal and UBER are all present. As well as the big players, Pebble also has a great community of developers supporting the platform (for example, control your Philips Hue lights with Huebble). The colour Time is also backwards compatible with previous Pebble apps, meaning there are an impressive 6,000 apps available for the device. Customisation is key to the Pebble Time, not only can you use any 22mm third-party watch strap, but there's thousands of excellent watch faces to choose from. From (our personal favourite) retro Mario, to a more sophisticated Mondaine inspired face -- there's something for everyone. The Pebble Time has a thriving developer community, it's comfortable and slim with excellentcustomisation options. Best of all -- a five-day battery life massively out-performs rivals. If you've tried more modern smartwatches this feels like a step back -- especially the screen. But we're willing to forgive its flaws, as usually they benefit other areas (battery life in particular). We're really impressed with the Pebble Time, despite its humble spec sheet it's snappy, with great battery life and personalisation options. It's also well priced -- in the UK it's available for £179.99 from Firebox-- this makes it a more affordable smartphone accessory (unlike the £299 Apple Watch). It does feel like a step back from the more flashy smartwatches, but at the end of the day we'd prefer a five-day battery life over an LCD touchscreen. 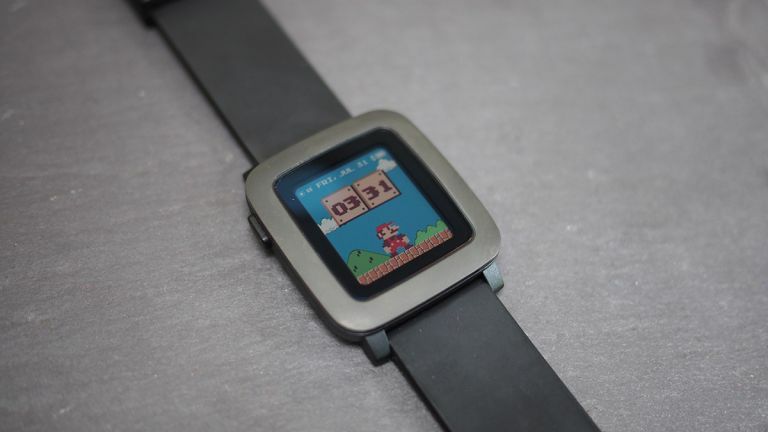 It's impossible not to like Pebble's second smartwatch, it's got charm and character, with it's geeky, retro design. If these things appeal to you -- you'll love the Time.